RxCelerate Ltd is an outsourced drug development platform based near Cambridge, UK. We specialize in delivering an entire road map of drug development services from discovery and medicinal chemistry through to formal preclinical development and clinical up to Phase IIa. In the last five years, we have witnessed dramatic changes in the drug development landscape, with the proliferation of virtual biotech companies taking often a single asset from discovery through to proof of clinical concept. Pioneered by Index Ventures, this powerful “asset-centric’ development model depends on an ecosystem of suppliers who can deliver the highest quality drug development services to these small, or even virtual, asset owners. RxCelerate was created to deliver that integrated drug development service, from discovery to the clinic. Our clients range from single employee businesses to multi-national pharma companies. But in each case, we take an asset and work with its owners to design the ideal development plan, and then execute it on their behalf. Why not visit our website and see the range of services we can offer your business? 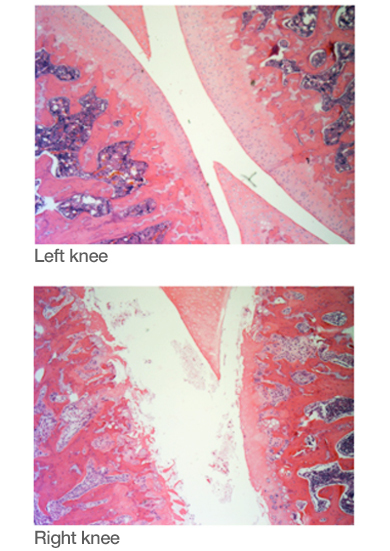 A particular focus for us are high quality in vivo preclinical models for a wide range of diseases, such as the low-dose MIA model of osteoarthritis (illustrated below) which we developed and validated in-house.